The superlow $200 price (as of February 21, 2013) for the Dell C1660w makes color-laser-class printing (using laserlike LED technology) tantalizingly accessible. Its text output looks great, and the color graphics are very nice indeed. Because the toner is expensive, however, the C1660w would be a good deal only if you didn’t print much (as we discovered when we compared inkjet pricing last year). The printer’s modest speed and features reflect the intended, light-volume audience. Setting up the C1660w couldn't be easier. The small footprint means it can be used virtually anywhere. USB and Wi-Fi connectivity are standard. We used the manual Wi-Fi setup, but there's support for WPS as well. A blue Wi-Fi indicator notifies you that the unit is connected wirelessly. The tiny two-line LCD display and control buttons are minimal, but effective. The software is spare, but you can surf from anywhere on your network to the printer's configuration pages to check status and see if you need more toner. There's also the full gamut of remote printing features, including printing from mobile devices and via email. Paper handling features on the C1660w are minimal. A front panel flips out onto your work surface to make the bottom of the 150-sheet input tray; a cover piece is included. The classic, indented output bin on the top holds 100 sheets. There's no automatic two-side printing (duplexing), but there is manual support for the process in the form of dialogs telling you how to reinsert the paper. Having an open-faced paper tray makes this process significantly easier. You can easily reach most of the paper path by folding down the panel on the back of the unit. Toner cartridges are accessed via a panel on the right side of the unit. Probably the least appealing aspect of the C1660w is its pricey toner. The unit ships with 500-page starter cartridges. The 4 cents you'll pay per black page is a little higher than the average for entry-level inkjets, and the additional 16.8 cents that adding color to the average page costs is pricey indeed. Black toner is sold in $50, 1250-page units; the 1000-page cyan, magenta, and yellow cartridges cost $56 each. There are, unfortunately, no high-capacity supplies. It's a bit pricey per page with color, but the C1660w's output quality matches that of laser-class printers costing considerably more. Text is outstandingly sharp, and black areas are smooth and uniform, if a tad lighter than we'd like. Color graphics and photos look outstanding. You'd have to spend six times as much on something such as Lexmark's c748de to see a significant improvement in photo output. You wouldn't want to wait while the C1660w prints out War and Peace, but speed is fine for light use. Black text and mixed pages of black text and monochrome graphics print at an aggregate 7.2 pages per minute (ppm) on the PC and 7.5 on the Mac. Full-page (letter-size) photos print to laser glossy paper at a swift 1.5 ppm. Smaller snapshot-sized (4- by-6-inch) photos print at 2.7 ppm to plain paper and just under 2.1 ppm to glossy laser stock. The C1660w carries a one-year warranty. You can up that to five years for $80; exchange and on-site services are also available. The drum/fuser is a lifetime unit, and those support options are reassuring when no replacement is readily available. Dell quotes a 30,000-page duty cycle, but in real life this is about a 500-page-a-month unit. Even if the unit can handle heavier use, print more than that and the pricey toner will start catching up to you. In that case you should look for a cheaper-to-operate unit. 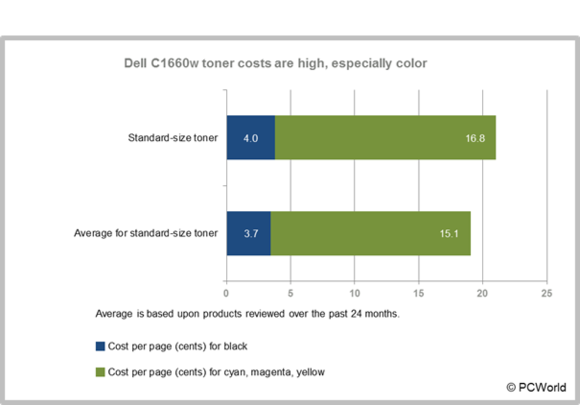 The Dell C1660w’s expensive toner and light-duty capabilities make it best for small or home offices. Before you reach automatically for a laser, however, it’s worth noting that office-minded inkjets such as the $100 Epson Workforce Pro WP-4020 offer better speed, competitive print quality, and much cheaper inks—and their multifunction cousins add more capabilities. The low purchase price makes color-laser-class (LED) printing available to budget-minded small offices. Because toner is expensive and there's no automatic duplexer, it's best for light use only.